LIMITED SUPPLY: One of the closest attachments to natural prey you can get for your cat. They wont be able to resist this one! The Wild Hare Chaser Attachment is made from Wild Hare Strips. 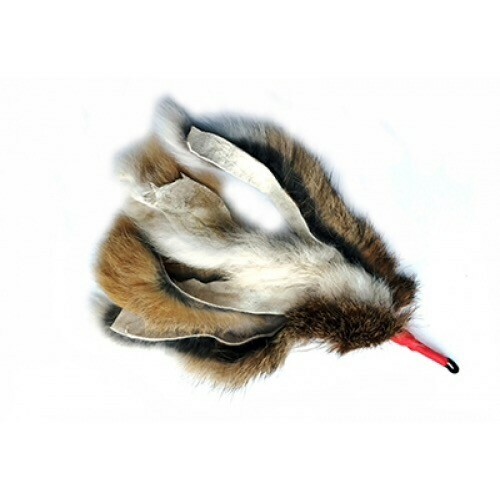 The availability of this product is limited due to the fact that the fur is from Wild hares in the UK and EU. The fur is a by-product from Wild hares living a natural outdoor life free from captivity and are protected under the Wildlife Act 1981 and the restricted conservation culling seasons. Absolutely no fur is sourced from intensively farmed animals without animal welfare/protection and no fur from outside the EU. Approx 15-20cm long with 3 natutal Wild Hare strips. Add a bit of variety to play time with this super realistic toy. Simply clip on to play! To complete a cat's natural hunt, catch, kill, eat cycle, use the Purrs wands and prey attachments as hunt/chase exercise toys. Provide a high protein snack/meal for their reward after the play session has finished to complete the cycle. All that's left to do is take a nap.